At 107 years old, Leopold Engleitner was thought to be the oldest male survivor of Hitler’s concentration camps. As a Jehovah’s Witness he was rounded up, and when he was finally released he was a physical wreck. 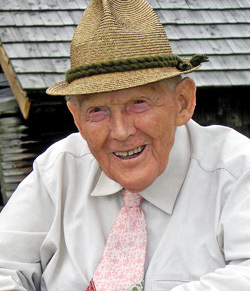 He was born in July 1905, the eldest son of a sawmill worker and a local farmer’s daughter. He described his parents as “poor but hardworking people”. He spent his early years in the Imperial town of Bad Ischl, amid scenic lakes and breathtaking summits. Even as a child he saw the disparity between the pomp and glitter of the few and the poverty of the masses. He also had to face the scorn and ridicule of his classmates as he was afflicted by congenital curvature of the spine. The resulting backache made it almost impossible for him to stand up straight. The end of the First World War brought greater poverty and disease. Engleitner, almost 14, was hit by Spanish flu, which caused many millions of deaths in Europe and beyond. He survived, and searched for work, but was turned down as being too weak for manual employment. Eventually he was taken on as a farm laborer. Like many others of his generation he questioned not only the inequality he saw around him, but also the folly of war. He had been brought up by his devout Catholic mother as a believer but he became disillusioned by his church’s attitudes to these issues and much else. In October 1931 a friend introduced him to the Bibelforscher [Bible Researchers], as the Jehovah’s Witnesses were known. He believed he had found what he sought and in May 1932 he was baptised as a Witness. This dramatic step brought him a few friends – but also many enemies. His parents were horrified, while the local priest denounced him from the pulpit and he was ostracised by his neighbors. In February 1934 open civil war broke out and Austria became a one-party state modelled on Benito Mussolini’s fascist Italy. It was no time to proclaim a rival faith; as Engleitner explained, “persecution was an inseparable part of my daily life. Though I was unemployed, I was denied unemployment compensation, and I was sentenced to several short and four longer prison terms because of my preaching activity.” Worse was to come. In March 1938, Hitler’s troops marched into Austria. Within a few days, thousands were arrested and sent to prisons and concentration camps, accused of opposing the Nazi regime. On 4 April 1939 it was Engleitner’s turn. He was arrested with three other Witnesses and, in October, was sent to Buchenwald concentration camp in Germany. By that time his co-religionists were dead. At Buchenwald, inadequate food, beatings and humiliation were to be expected daily. More than once, Engleitner was threatened with execution. In March 1941 he was sent with others to Niederhagen concentration camp. They joined nearly 4,000 other prisoners – political prisoners, homosexuals, prisoners of war, Jews, Roma and Jehovah’s Witnesses. Their job was to work on the transformation of the nearby Castle Wewelsburg, which was to become Hitler’s palace. About a third of them died there. After a few weeks at Ravensbrück camp, in July 1943, Engleitner was unexpectedly discharged, expected to do agricultural forced labour for the rest of his life. His skin had been partly eaten away by lice, beatings had left him deaf in one ear and his body was covered with festering sores. He weighed 54lb. His freedom was short-lived; the following month he was ordered to report for a medical examination. Remarkably he was pronounced fit for active service at the front. His call-up finally came on 17 April 1945; he went into hiding and somehow managed to stay alive in the mountains until the Americans occupied Austria in May. Other Witnesses had been guillotined for refusing to do military service. After the war Engleitner was forcibly employed on his friend’s mountain farm. It was only after the occupying American army intervened in April 1946 that he was released from the obligation to perform agricultural labour. His co-religionists became active in Bad Ischl and he joined them in his spare time, having found work as a nightwatchman in a factory. Eventually he settled down in the St Wolfgang area, and in 1949 he married Theresia Kurz, They were together until her death in 1981. The Mauthausen Committee said that Leopold Engleitner died April 21.